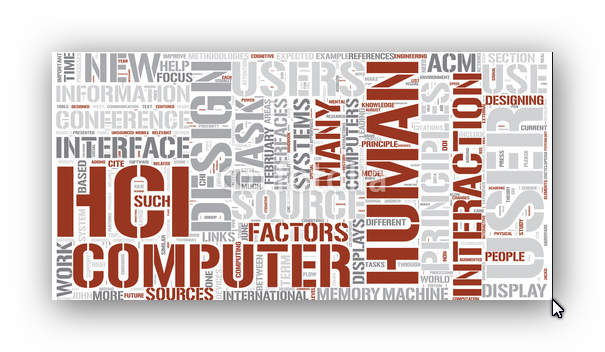 Human Computer Interaction (HCI) is a set of processes, dialogues and activities through which users utilize and interact with the computer. When we use computers, we interact with computers. At this time we're giving commands to the computer, and the computer system receives the command then ditanggapinya until our work is complete. 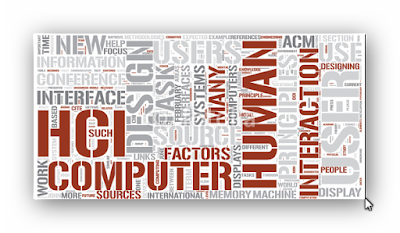 Definition of HCI, a discipline that emphasizes the aspects of design, evaluation, and implementation of interactive computing systems for human purposes by considering the phenomena around the man himself. There are several aspects to be considered for the design, evaluation, and implementation of interactive computing systems for human purposes by considering the phenomenon around the man himself. Not to learn the computer or a human, but to be the bridge that connects humans with computers. --- Human-computer interaction is a discipline concerned with the design, evaluation and implementation of interactive computing systems for human use and with the study of major phenomena surrounding them. " Thus it is clear that the focus of attention not only on the beauty HCI zoom or only focused on the display interface, but also pay attention to aspects pamakai, system implementation design and environmental phenomena, and others. For example, the system design should pay attention to user comfort, ease of use, easy to learn etc . The goal of HCI is to produce a useful system (usable) and safe (safe), meaning that the system can function properly. The system could be to develop and improve the security (safety), utility (utility), interoperability (usability), effectiveness (efectiveness) and efficiency (eficiency). The system is context not only on hardware and software, but also include the environment as a whole, be it a neighborhood community organization work or family environment. While the utility refers to the functionality of the system or the system can improve the effectiveness and efficiency of its work. Interoperability (usability) is here meant that Sstem that made it easy to use and easy to learn either as individuals or groups. Opinion Preece, J. above is based on the premise that states that the interests of users of the system should take precedence, the user can not be changed radically to the existing system, the system is designed to be compatible with the needs of the user. Furthermore, in interacting with a computer, users will first be dealing with computer hardware. To arrive at the contents to be conveyed by the software, the user is confronted first with a set of tools such as a keyboard (keyboard), monitor, mouse, joystick, and others. Users should be able to operate a set of these tools. Furthermore, users will be faced with a variety of menu display, a variety of command consisting of a word or words to be typed in, for example, save, copy, delete, or a variety of icons. Equipment, commands, icons and others mentioned above are known by the name of the interface (the interface). This interface is the first layer directly face to face with the user.